Configuring alerts properties allows setting the device to be monitored, event type and action to be applied. In the Name field, you can select the device to be monitored either directly from the list (by selecting name on the map) or by entering the IP-address or hostname in the field (Fig. 1). Fig. 1: The Alerts properties window. In the Event field, set the select box to desired position. Start - triggers when the background ping on selected device does respond. Stop - triggers when the background ping on selected device does not respond. Action - actions, which the program can execute subsequently when some event triggers. Displays predefined text message. You can specify time duration for displaying message window. Launches external application, with parameters if necessary. For instance: if you specify the net command as the application (available in Windows NT, 2000, and XP only) and send <computer name> <message text>, you can receive messages from computers that run LANState while you are working on a remote computer. Plays specified audio file (WAV). Saves message text strings to log file, the name of which you can specify in the properties (by default, it is Alert.log in the program's folder.) On the same screen you can view the existing log file as well. 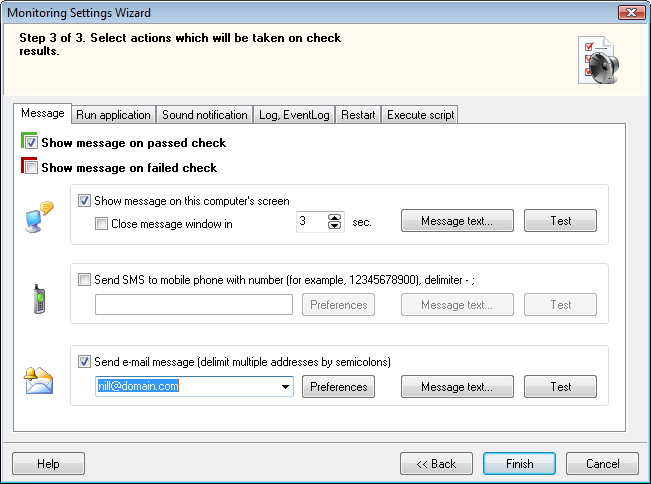 The program sends SMS by sending an E-Mail message to the cellular operator's SMS server. A majority of GSM operators have special e-mail addresses (something like your-number@your-provider.com) which accept messages and deliver them to your cell phone via SMS (Usually they deliver e-mail's subject only). You must enable this feature at your operator and find out server's address and message composition rules (number in message body, text in message body, etc.). Get this information from your operator's customer service. Then create your own template and specify country code prefix (without the "+" sign). Mail server settings described here. Mail server settings described here. Note: when alarm triggers for different events, messages can be sent to different addresses also. Once you have set all properties that are required, you can test out the alarm's performance by clicking the Test button. All actions that are selected (marked with the checkmarks) will be executed.